Minibuses come in all shapes and sizes and are used for a variety of tasks. Businesses rely on minibuses for transporting employees to corporate meetings or as a way to drop off workers after shifts. Public schools use minibuses as a way to take children on school trips and nursing homes benefit from minibuses to allow residents to journey outside of the home on shopping excursions, the list of uses is endless. 19 seat minibus hire is popular with all kinds of people and the UK is an excellent place to find what you need. 19 seater minibuses are not the most popular models on the market and some companies will supply 16 and 24 seat minibuses as the closet equivalent; there may be occasions when you may need to opt for the larger vehicle. This is not to say that 19 seater minibuses aren’t available. The UK has one the best markets in the world for minibus hire and all sized groups can be catered for. 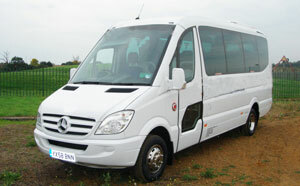 With 19 seat minibus hire you are likely to find luxury models as the most widely available. A luxury minibus will be not be offered on a self-drive basis and is likely to cost more to hire than a standard addition, but the benefits are evident and opting to go for a luxury model is the best method of road travel you will find. Luxury minibuses are commonly used by sports team s travelling to games and corporate executives heading to conferences. They are also popular with people travelling on weekends away for birthdays and stag or hen parties and will give the group the chance to travel in style. The majority of 19 seat luxury minibus models are manufactured by Mercedes, who are known world-wide for producing high standard vehicles that are stylish and luxurious. The Mercedes Sprinter and the Mercedes Vario are two of the popular choices of luxury 19 seat minibus hire. Both have the space and versatility that is required to produce a high end minibus. Most rental firms will only have one 19 seat luxury minibus in their fleet and hire demand will be high throughout the year, booking early is recommended to avoid disappointment. Many companies allow booking up to three months in advance, to do this you will need all of your travel plans in order. You should be clear on your travel preferences to ensure that you receive an accurate quote from the hire company.